We hope this holiday season Mammut can bring cheer to your home. However, rather than simply outfitting you we would like to give a gift that keeps on giving: education. Mammut is partnering with four guide services across the US to offer skiers and riders a 30% discount on the cost of a Level-1 avalanche safety course when you purchase a Mammut airbag or beacon. 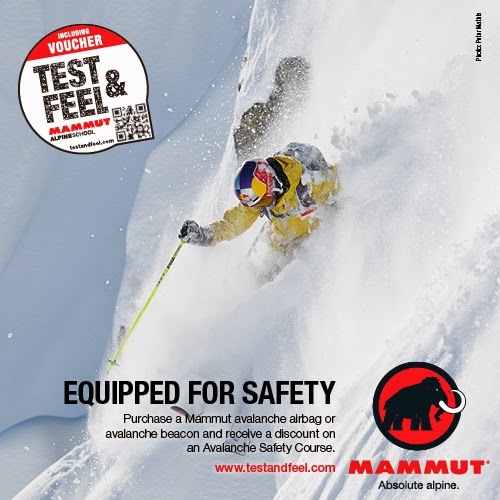 All Mammut avalanche airbags and avalanche beacons come with a "test and feel voucher" which is redeemable for the course discount at one of these participating providers. Bring the voucher coupon and an original sales receipt from your airbag or beacon to your course, and Mammut will pick up 30% of the tuition. Course space is limited so book early! From all of us here at Mammut, have a safe and happy holiday season!